I saw this the other day on the sidebar of my Facebook page and something struck me a little off. I love Starbucks and I love it when corporations get behind these major causes but I can’t help but think how much of a greater impact could be made if the 248,042 folks who have already said they will buy a “hand-crafted beverage” at Starbucks on Monday donated the full-price of that beverage to help save lives in Africa. I did some basic math and if 300,000 folks buy a drink on Monday, the Global Fund gets $15,000…Starbucks gets significantly more! 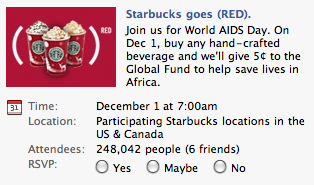 Now if Starbucks were to encourage folks to give up their daily “hand-crafted drink” this Monday for World AIDS Day and donate the money to an organization working in Africa, the total would be close to a $1 million dollars!